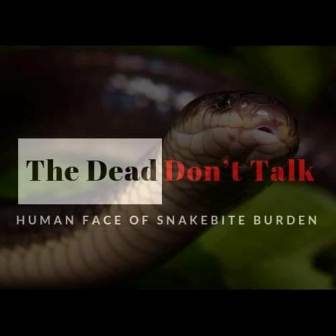 Featuring the lives of snakebite victims (both dead and alive) and their families from across the country, a documentary film ‘The Dead Don’t Talk’ urges for a “multi-pronged approach” when it comes to snakebite envenoming and mitigation. India is the “Death by Snakebite capital” of the world and witnesses nearly fifty thousand deaths annually. This means one person dies due to snakebites in India every 10.5 minutes on an average day. Such high number of deaths and disabilities and yet this issue “fails to occupy the topmost priority from a human rights’ perspective”. Bringing this aspect to the fore is the December 2018-released documentary film ‘The Dead Don’t Talk’ produced by advocacy organisation Snakebite Healing and Education Society (SHE). Featuring the lives of snakebite victims (both dead and alive) and their families from across the country, the 23-minute film urges for a “multi-pronged approach” when it comes to snakebite envenoming and mitigation. “Snakebite envenoming does not interest too many people. But it is an everyday reality for several lakhs of people. 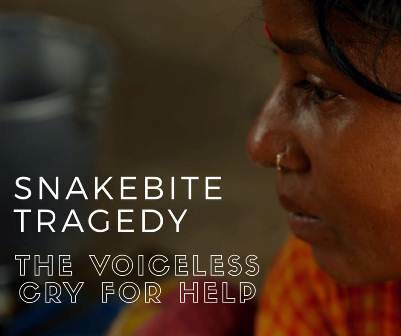 The film has been made to create awareness about the human and socio-economic devastation that snakebites cause in India,” Priyanka Kadam, founder of SHE, and producer of the film tells Delhi Post at a special screening held recently at Médecins Sans Frontières’ office (MSF) in New Delhi. While the ‘Minutes to Die’ documentary produced by the Lillian Lincoln Foundation in September 2017 documents the stories of survival and struggles faced by vulnerable populations in India (Tamil Nadu), Kenya (Baringo County), Papua New Guinea (Port Morseby), Costa Rica (San Jose), England (Liverpool), Switzerland (Geneva) and United States (SF and Yale University), SHE’s film takes a closer look back home and gives a reality check about what is happening in India. The film opens with a story about a little girl called Shrabani who was bitten by a Common krait at night in West Bengal’s Loharpara. By the time, she was rushed to the nearest hospital, it was too late. Another story documents the ordeal of Sheetuben Dhadhar from Dharampur, Gujarat who was in her ninth month of pregnancy when a cobra bit her. She delivered safely even when the Snake Anti Venom was being given. Nine years later, she still carries the raw wound on her foot. With such heart-breaking testimonies of victims from states like West Bengal, Tamil Nadu, Gujarat and Maharashtra where the film was shot over four months, and featuring stories from across India including Karnataka, Arunachal Pradesh, Kerala, Chhattisgarh, Uttar Pradesh, Odisha and Rajasthan, the film explores the inadequacies of the health machinery and health providers besides highlighting the deep-rooted belief in faith healers in various states of India. “The biggest challenge is that Health is a state subject. And at the state level, health departments don’t have the requisite information on the accurate number of snakebite cases reported in the various government hospitals of their state as snakebite is not a notifiable disease,”points out Kadam, who started SHE in 2014. “There is also no real time reliable data of which hospital treats snakebites and has an available stock of snake antivenom besides other infrastructural issues,” she adds. Notably, the big four, namely, Spectacled cobra, Common krait, Russell’s viper and Saw scaled viper are found commonly in the rural agricultural fields, grassland and close to human habitats across the country. “No one should die of snakebite. It is a treatable condition provided correct and on time treatment is available. Every second counts,” Kadam says. Recognised and listed by World Health Organization as one of the Neglected Tropical Diseases (the only Non-Communicable Disease to be so) since March 2017, estimates suggest that more than 45,000 deaths are caused by snakebites. Even the 71st World Health Assembly (WHA), adopted a resolution to address the burden of snakebite in 2018. “The actual numbers can only emerge when snakebite is made a notifiable disease,” mentions Kadam. Notifiable status would mean such deaths are compulsorily reported to the State Health department and other government authorities under law. “There is a need to look at these incidences from a humanitarian perspective. Broken families, loss of a parent, loss of livelihood and in a death situation, the eldest child forced to drop out of school to take care of the family. Financial burden results in bonded labour which continues for many years and pushes the victims and their families into further poverty and deprivation” Kadam, who is also a member of WHO’s Snakebite Envenoming (SBE) Working Group, tells Delhi Post. One of the victims that the film features is Kirti Sahu from Pithora, Chhattisgarh. Her treatment burdened the family with such a heavy loan that her husband committed suicide. Kirti struggles to survive with a family to provide for. While snakebite is considered a poor man’s disease or issue, the socio-economic costs are exorbitant. Even if snake antivenom is available, the quality in many cases is questionable. Delayed treatment and the lack of medical infrastructure to treat snakebites in rural India along with untrained doctors and health care workers in the government hospitals continue to add to the woes of snakebite mitigation in India. While sharing her experience of bringing together experts from different fields on behalf of SHE, which comprises of an advisory board of snakebite expert doctors, human right activists, scientists, herpetologists, lawyers, retired bureaucrats and NGO partners in various states, Kadam says despite availability of experts, young doctors remain hesitant to treat snakebites. ‘Hospital but no Snake Anti Venom. Ambulance but no driver. Oxygen but no mask. Doctors but no knowledge. Treatment that exists but is not available. What is the way out?’ is a poignant note in the film. Possible solutions? “Snakebite treatment to be taught in medical colleges with an extensive training on snakebite management to young doctors prior to their rural internships. Young doctors to be taught to handle medical emergencies in a rural setting. There is also a need to create community awareness as prevention is better than cure. SHE is working with the state level Health & Forest Departments to roll out community level awareness drives,” Kadam tells Delhi Post.